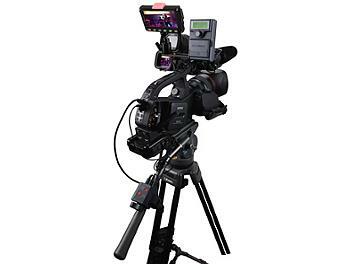 The TLM-43LB is a Camera Look Back System which includes the TLM-430 Look Back Monitor, the RMC-200 Camera Remote Controller, the BH-08 Ball + Head Bracket and AC adapter. In addition to operating a range of cameras from Panasonic, Sony & Canon, the TLM-43LB system can also control a Datavideo DN-60A CF Card recorder (sold separately). Datavideo's TLM-430 is a 4.3 inch Look-Back monitor ideal for use as either a electronic viewfinder or for confidence playback previewing. The TLM-430 has a large built in tally light to ensure good communication between with the studio and also makes it easy to identify which camera is live.